The image of Jesus sitting alone in the shadows of a city street with a cardboard sign, begging for food, should force us to reconsider our attitudes and actions toward the homeless. 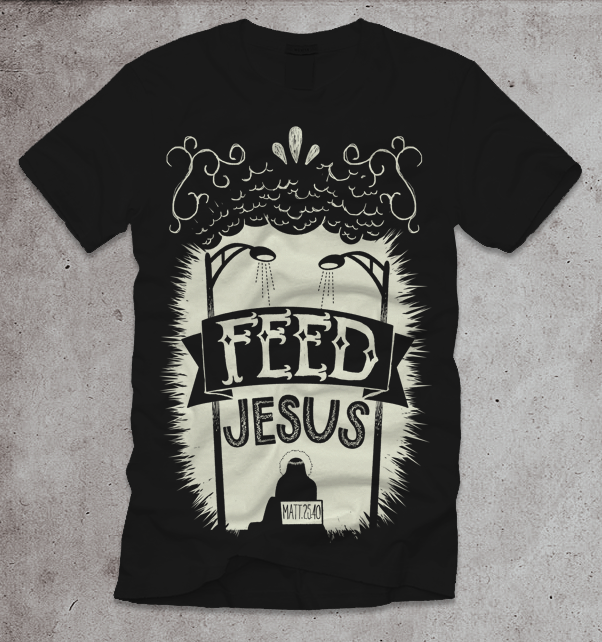 This shirt reminds me of Timothy P. Schmalz’s Homeless Jesus sculpture, which likewise is meant to stir Christians out of their prejudices and indifference and awaken in them a hunger for gospel-driven social justice. This entry was posted in T-shirts and tagged christian t-shirts, feed the homeless, jesus t-shirts, matthew 25, the least of these. Bookmark the permalink.